Trust me, you are going to love the video below! It is one of the most remarkable encounters I have witnessed in all my dives. It’s a fortunate enough thing to be able to watch a large Giant Pacific Octopus when it is hunting. In this encounter, the octopus passes directly over a mature male Wolf Eel in his den. THEN, a Decorator Warbonnet emerges as well. It was an exciting day in this wonderful marine neighbourhood. I hope this 3-minute clip allows you to share in the awe and excitement. For me, this was the NE Pacific Ocean equivalent of seeing a giraffe, elephant and rhino in close proximity. Video and photos contributed by dive buddies Katie Morgan and Diane Reid while on our trip with God’s Pocket Dive Resort. For more information on Wolf Eels (including that they are not an eel at all), see my previous blog here. 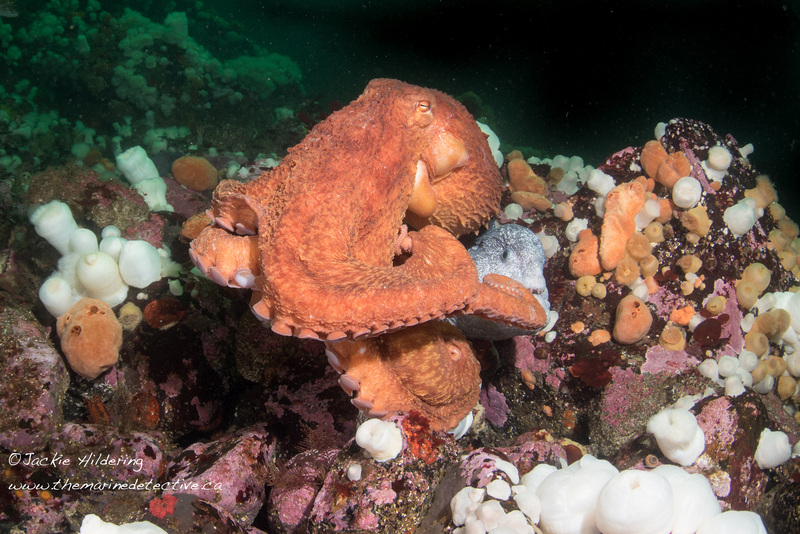 For more information on Giant Pacific Octopuses, click here for previous blogs and here for a blog specifically on hunting in Giant Pacific Octopus. 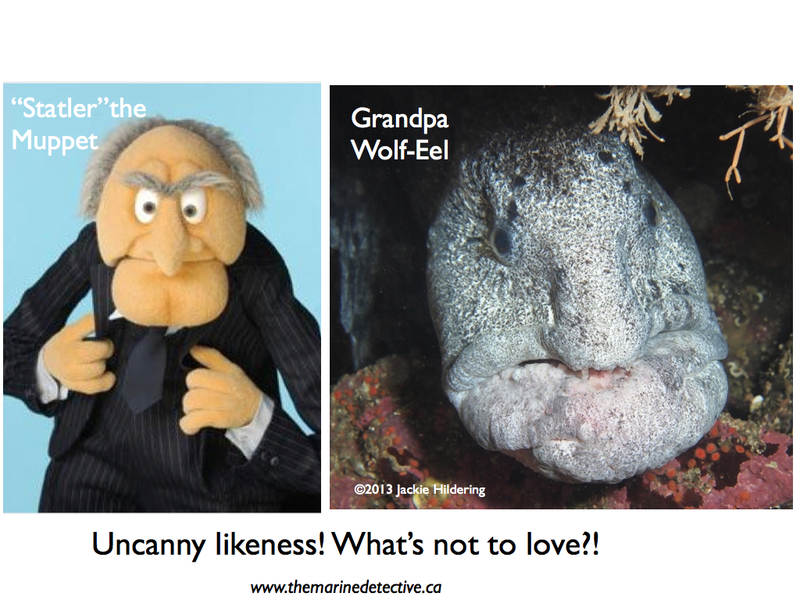 Wolf-Eel – No Ugly Fish! Don’t say it, please don’t say it. This is not an ugly fish. It hurts when people say this about Wolf-Eels. Such is the way when there is misunderstanding and disrespect for something you love. There is no ugly in Nature – only perfection. If the features of an animal appear foreign to you, it is because it fulfils a role in Nature that is truly awe-inspiring; possibly even beyond your imaginings. Mr. and Mrs. Wolf-Eel near Port Hardy ©Jackie Hildering. I hope to make this point by sharing with you why the Wolf-Eel is “designed” as it is and how very wrong many of us are in our perceptions about this species. The Wolf-Eel (Anarrhichthys ocellatus), which can be as long as 2.4 m, is not an eel. Wolf-Eels belong in the Wolf Fish family (Anarhichadidae). They are desperately misunderstood. Wolf-Eels are not dangerous nor “mean”. The opposite is true. They are reclusive, anything but ferocious, quite sedentary and slow moving. Mature male Wolf-Eel, about 2 m long. Can be 2.4 m ©Jackie Hildering. Yes, they have large, fleshy, ossified heads and the species has sharp teeth but this is so they can do what so few marine species can – they can feed on spiny sea urchins, snapping them effortlessly into pieces without suffering a single puncture. They also feed on other hard-shelled animals like shellfish and crabs. Even the roofs of Wolf-Eels’ mouths are impenetrable with ossified, tooth-like projections (see photo below). Mature males are bigger and have fleshier heads. Each Wolf-Eel has distinct spots around their eyes which helps recognize them as individuals ©Jackie Hildering. The upper jaw of a Wolf-Eel. Impenetrable to even urchin spines! ©Jackie Hildering. To my knowledge there has never been an attack on a diver UNLESS, and here comes the predictable thing, we choose to habituate them. Wolf-Eels spend a great deal of time on the ocean bottom in dens where, as divers, we have the enormous privilege of “visiting” the same spot and seeing the same individuals for years. It is not just their address that makes them recognizable as individuals. Each Wolf-Eel has a unique pattern of black spots near their eyes. 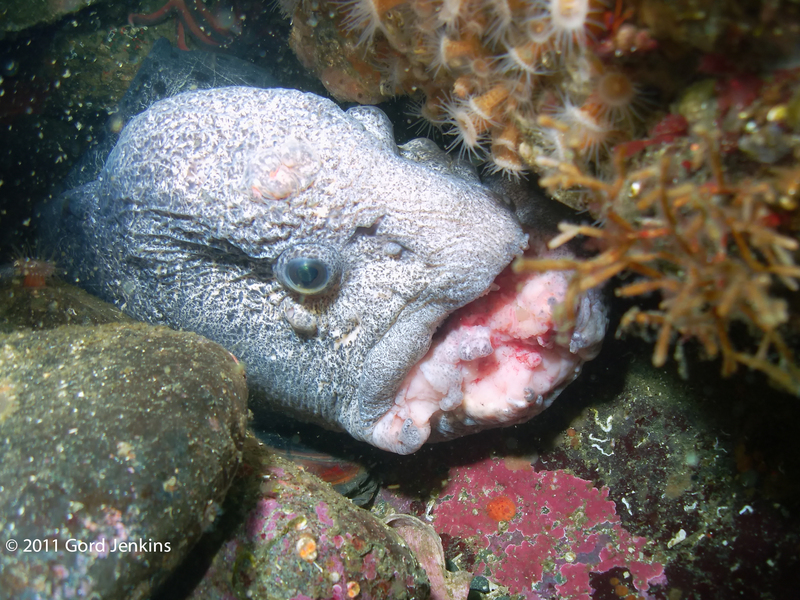 Grandpa Wolf Eel near Port Hardy ©Jackie Hildering. Mature male bearing the scars of battle ©2011 Gord Jenkins. Wolf-Eels have long-lasting pair bonds, coming together when they are around 4-years-old and having their first clutch when they are around 7. In aquariums, their life expectancy is known to be at least 28 years. Both male and female juveniles are brownish orange and look even more eel-like, lacking the big head of the adults. As adults, the females are smaller and a darker brownish grey (both remarkably camouflaged for when they are in their rocky dens). They do also sometimes need to do battle for den space with a Giant Pacific Octopus. This is likely another driver for the male’s having such fleshy heads – they are better able to survive the wounds inflicted by such battles. Clearly, another unique feature about this species is their eel-like body. They are the only member of their family that have this body shape. The long tail serves in locomotion, powering them forward with big, slow, s-shaped waves while being stabilized with the long dorsal and pectoral fins (see video below). Having a long tail also allows them to den-up, curling up and around in narrow spaces between rocks and . . . wait for it . . . it lets them hold onto their eggs. Mated pair tending their egg mass. Note how much darker and smaller the female is ©Jackie Hildering. Female Wolf-Eel guarding eggs. ©Jackie Hildering. Mating apparently most often occurs between October and December, with the female releasing eggs after the male prods against her swollen abdomen. He then wraps around her to fertilize the 7,000 to 10,000 white to yellow eggs that she will mould into a ball shape. This mass does not need to adhere to anything because the parents will take turns wrapping their tails around the mass, holding and turning it for good aeration until the +/- 3.5 cm young hatch some 13 to 16 weeks after fertilization. Juvenile Wolf Eel ©Jackie Hildering. The juveniles settle into the adult sedentary lifestyle between the ages of 6 months and 2 years (presumably dependent on food supply and den availability). One juvenile is even known to have travelled a minimum of 1,000 km; having been tagged in Port Hardy, BC and found back in Willapa Bay, Washington two years later. It was long thought that Wolf-Eels always mate for life but, this is not always the case. The males do compete for females who will sometimes opt to swap dens and go live with the competitor. Sound like any other species you know? Wonder if it happens at mid-life? The Wolf-Eel is indeed akin to us in so many ways. It is a homebody that likes crunchy snacks and prefers that they come right by the front door; they are great parents and are docile unless fighting for home or partner. They invest in durable relationships and – they are only as strange looking as we terrestrial bipeds would appear to them. And if all of that is not enough for you, see the photo below for the indisputable reasoning for by Wolf-Eels are NOT ugly fish! Statler the Muppet is cute and loveable. Ergo – so are Wolf-Eels. Case closed!! Range: Sub-tidal to 226 m; Baja California (Mexico) to the Aleutian Islands (Alaska); west to Russia and south to the Sea of Japan. Mated pair near Port Hardy ©Jackie Hildering. Me and a mature male Wolf-Eel ©2012 Norris Colby. Mature male Wolf-Eel ©Jackie Hildering. For these and more images of the Wolf-Eel, please see my gallery at this link. Remarkable video of a mature male Wolf-Eel eating a Giant Pacific Octopus by Andrew Eve. Lamb, Andy and Edgell, Phil. Coastal Fishers of the Pacific Northwest – Second Edition. Pers. communication Dr. Jeff Marliave, Vice President, Marine Science, Vancouver Aquarium.